OpenMBD.com currently provides two important tools to enable Rapid Control Prototyping (RCP): HANcoder and HANtune. The combination of these tools provides an efficient workflow for generating executable code and visualizing and tuning your control system. HANcoder can be used to model, simulate and build your control algorithm. In order to make it as convenient as possible to set up a new project, a simple demo project is presented as a starting point to start developing your own control algorithm. The demo project contains a simple blinking LED which can be built and flashed right away into the controller to see if everything works as it should. All that is left for you to do is add functionality. 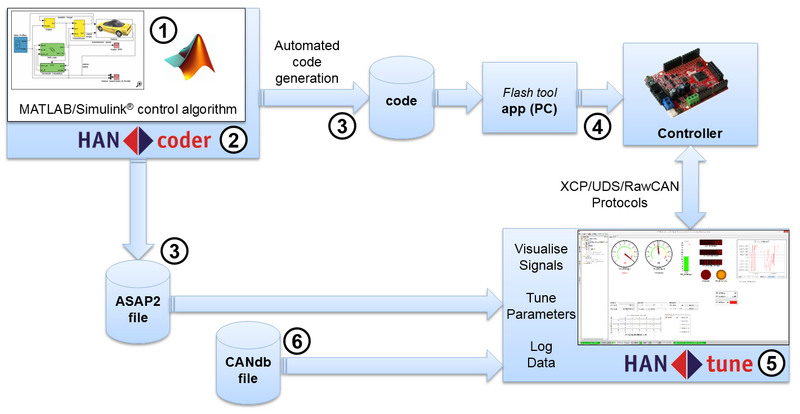 To add functionality, HANcoder provides a set of easy to use blocks with the most common functionalities, on top of the standard Simulink toolbox. Adding CAN support for example is as easy as to drag-and-drop a CAN block. After the build process has finished, these files are automatically generated and the flash tool will automatically be started. All that is required to flash the software (.hex or .srec) onto the controller is a controller-reset. Software can be flashed using MicroBoot, which is provided with the HANsuite. Microboot supports flashing over USB, Ethernet and CAN. The .a2l file has to be loaded in HANtune. It’s a descriptive file containing info about all parameters and signals which could be used to monitor and calibrate the controller via HANtune. When the .a2l file is loaded in HANtune you can drag and drop those parameters and signals into tabs. After connecting to the controller signals can be visualized and parameters can be altered in real-time.